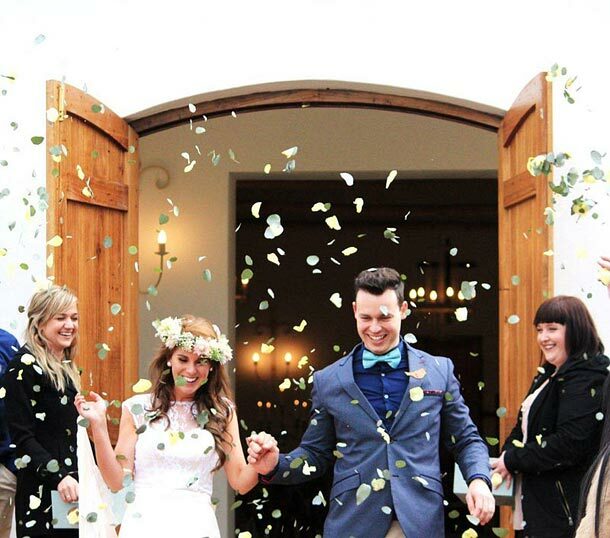 Vondeling Wines is the perfect venue for your wedding with up to 100 guests. The room offers an elegant minimalistic ambience and a touch of Cape country style – a beautiful setting for a wedding. The recently completed St Clement’s chapel at Vondeling promises the bridal couple the day of their dreams. St Clement’s is conveniently situated alongside the tasting room with rolling lawns and spectacular views of the escarpment. Complete with thatch roof, stained glass windows, steeple and bell, St Clement’s will make a wedding in the winelands unforgettable. The Farm House at Vondeling was originally built in 1750 and has been immaculately restored to its former glory. Exclusively for the use of wedding guests, The Farm House comprises seven en-suite bedrooms, which are luxuriously appointed and extremely comfortable. Other areas in the house include a fully equipped kitchen, a dining and sitting area and a cosy fireplace. The recreation room houses a snooker table, table tennis table, and satellite TV, DVD and video player. The farmhouse has two extremely efficient housekeepers and a wonderful chef who will do as much – or as little – during your stay. Surrounding The Farm House are peaceful gardens and a delightful shaded terrace, a 20m swimming pool, BBQ area and a spot-lit tennis court. Brides-to-be are welcome to contact us for an appointment to view the venue, The Farm House and St Clement’s Chapel to start planning that special day. We offer cheerful and efficient service and sound advice and look forward to welcoming you to Vondeling Wines. To book this venue visit Vondeling Wines.